I thought Yamato Toys had already stopped producing the 1/48 line of VF-1S given the redesign and success of the 1/60 series, then they come out with this. 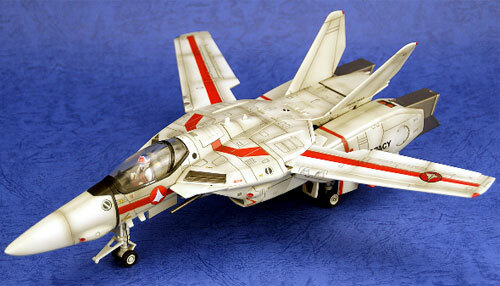 The iconic VF-1J of Hikaru Ichijo, treated to a weathering paint scheme to give it that battle weary look. Based from the specs, I don't see anything new other than the paint job. The toy is about 30cm long in fighter mode. The 1/48 Macross Series of VF-1S by Yamato Toys put their 1/60 version and the 1/55 version of Takatoku/Bandai to shame in terms of realism. Even the ailerons of the wing move! I guess the only drawback of the 1/48 version is the need for bigger cabinet space. Check out a comparisson of Macross Toy Sizes here so you can get an image of how the other Macross toys stack up to each other. 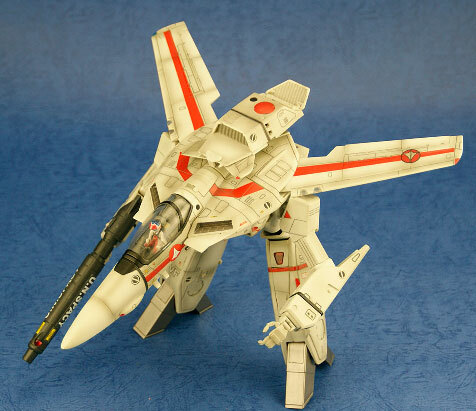 Of course I just had to be a nitpick by questioning why Hikaru Ichijo got a VF-1J for his first mount in Macross, given the fact that he wasn't a squadron leader, hehehe. 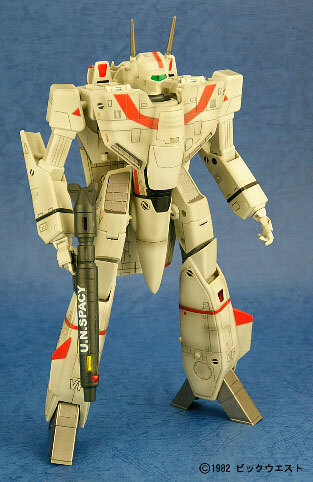 He should have gotten a cannon fodder VF-1A instead as a rookie pilot. Then again, old friend and mentor, Roy Fokker could have pulled some strings to get him the VF-1J. Hikaru's VF-1J was shot down a couple of times in the TV series, the last time being in a failed Daedalus attack by Misa Hayase which resulted in him getting caught by friendly fire and hospitalized. While in the hospital he had to deal with not only getting well but with the loss of his mentor, Roy Fokker. After getting out of the hospital, Ichijo not only inherited the famed Skull Squadron of Roy Fokker, but also his mount, the VF-1S.